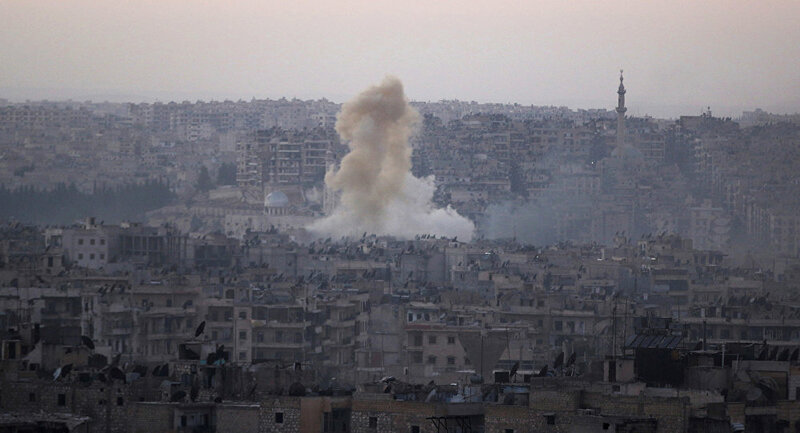 Government-controlled areas of Syrian Aleppo were once again shelled by militants. The shelling killed seven children and injured ten. Western media ignored the tragedy since its does not correspond with West’s stance towards the Syrian crisis. On Thursday, at 8:00 a.m. local time, children in Aleppo were going to school. Right at this time, Islamists shelled the Christian district of Suleiman with mortars. Several shells exploded near the school’s entrance, killing seven children. Ten children were injured as a result of the shelling. They were hospitalized with wounds of varying severity, a representative of Al Razi hospital told RIA Novosti. Almost every day, militants blocked in eastern Aleppo shell the western part of the city and front-line areas. Shelling usually intensifies when the Syrian Army carries out offensive operations. Several families were among the casualties of the shelling. One girl was killed during the shelling and her brother was severely wounded and hospitalized. Doctors are continuing to save his life. "The shell exploded very close to him. The boy sustained shrapnel wounds and severe brain damage. There are shell fragments in his head. Chances are small, but his heart is still beating and we will fight for his life," Doctor Dzhan Fattouh told RIA Novosti. According to Syrian doctors, since the beginning of September, a total of over 130 children have been killed in shelling of residential areas. All of them died from shrapnel or gunshot injuries. Militants shells the western part of Aleppo with mortars and "hellfire" guns, leaving dozens killed and hundreds wounded every day, Lt. Gen. Sergei Rudskoy, Chief of the Russian General Staff's Main Operational Directorate, told reporters. "All the parties involved in the conflict have been committing crimes, including killings, injures, attacks on schools and hospitals as well as blockade of humanitarian supplies. This must be stopped," UNICEF Regional Chief of Communication for Middle East & North Africa Juliette Touma told RT. Despite the scope of the incident, Western media has almost ignored it. However, journalists have access to the area and hospitals with wounded children. "Today, I’ve read and watched news reports, and there was nothing about this shelling," Nikolai Pakhomov, president of the New York Consulting Bureau, said. "The reason is that American media translates those views of domestic and foreign affairs that correspond with the policy of the US establishment. Its official position is that Syrian President Bashar Assad is to blame for the situation in Syria, and Russia is helping him. The recent shelling of Aleppo contradicts this approach, so the situation has been ignored in media," he pointed out. However, alternative views of the situation are also presented in Western media. "Right activists, experts and some media outlets have repeatedly said that Assad’s opponents committed crimes. But the overall situation is what I described," the expert told RIA Novosti. Currently, nearly 600 wounded people need to be evacuated as soon as possible from Aleppo, including 400 children. However, the UN does not have the entire list, UN Deputy Special Envoy for Syria Ramzy Ezzeldin Ramzy said Thursday. "Utmost in our mind is the need to address the very concerning medical situation. Many hospitals have been damaged by airstrikes and medical supplies are dwindling. It is estimated that as many as 600 wounded cannot be provided with adequate treatment," he said during a briefing in Geneva. He also underscored that medical evacuation from Aleppo is impossible until a ceasefire is established in the city. The situation remains difficult, but there are options to improve it, he added. One of those scenarios was recently proposed by UN Special Envoy for Syria Staffan de Mistura. On October 6, he proposed to accompany militants from the Nusra Front jihadist group if they wanted to leave Aleppo with arms and to head for the city of Idlib. He added that there were some 900 militants of the group in the war-torn city. However, Ramzy said that al-Nusra Front rejected the proposal. "De Mistura made an appeal, he made an appeal directed to al-Nusra, but he also made an appeal to those who can help with the appeal. We have heard from al-Nusra, not surprisingly, a negative response," he said. However, the UN hopes that militants will withdraw from the city. "Our understanding is that this particular appeal has found resonance in certain quarters, and they are working to make it happen and we hope that this will be the case," Ramzy added. In turn, the Russian military said that it is ready to secure withdrawal of armed militants from eastern Aleppo, Rudskoy told journalists. However, the Syrian government was skeptical about de Mistura’s offer. "De Mistura was not serious about his proposal because he did not secure it in the UN Security Council," Syrian National Reconciliation Minister Ali Haider told RIA Novosti. 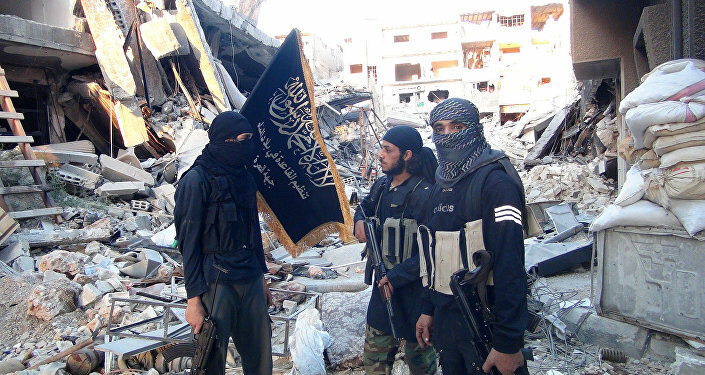 According to the minister, al-Nusra Front militants will not leave Aleppo voluntarily.